As I was employed by RISØ from 1991 to 2000 - this period will not be described in details, as the rights of information are limited, and must be cleared with RISØ. RISØ rented the Sparkær Centre from 1991 to 1996. In 1996 RISØ acquired the centre, and enhanced the facility. * Note the aesthetic design of the Turbine - The exterior design of this first Nordtank Megawatt Turbine was performed by world famous Danish designer Jacob Jensen, also known for his design of the Bang & Olufsen Televisions and many other products. In 1997 this Turbine design received the German IF award and RED DOT award. Since 1997 - the building has been enlarged twice to allow for test of still longer blades. The new test hall with test-rigs for 50 m long blades enabled us to run static and fatigue tests in a controlled environment. Note the remote controlled cameras on top of the two white test rigs. The blue safe room is where engineers and data acquisition equipment is located under a static blade test. At blade failures, the test hall can be a dangerous place. 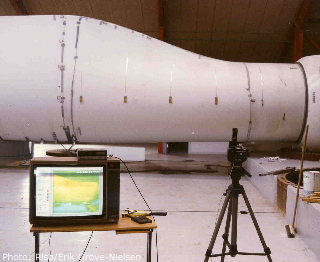 In year 2000 Erik Grove-Nielsen left the Sparkær Centre to work in his new company ReFiber ApS - with the development of recycling techniques for fibreglass waste from the Wind Power Industry. A new company BLAEST now owns and runs the facility, and a new Mega blade test facility is added at the harbour of Aalborg. BLAEST is owned by RISØ , DNV and FORCE Institute. 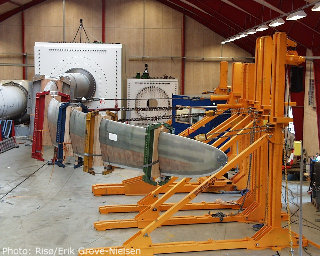 One reason for establishing a blade test at the harbour of Aalborg is, that road transport to inland Sparkær is problematic for blades exceeding 50 meter length.